For all the things wine does right — and it gets a lot right — perhaps its lone bad quality is how quickly its quality deteriorates after becoming uncorked. Even top-shelf bottles of wine lose some of their distinct characteristics a mere day or two after being opened. Knowing this to be a problem plaguing wine drinkers all over the world, a California-based company named Vestia Products decided to design and launch the Vestia Automatic Vacuum Wine Saver. Vestia ‘s product utilizes innovative vacuum-seal technology that helps prevent oxidation — i.e., the spoiling of a perfectly good bottle of wine. 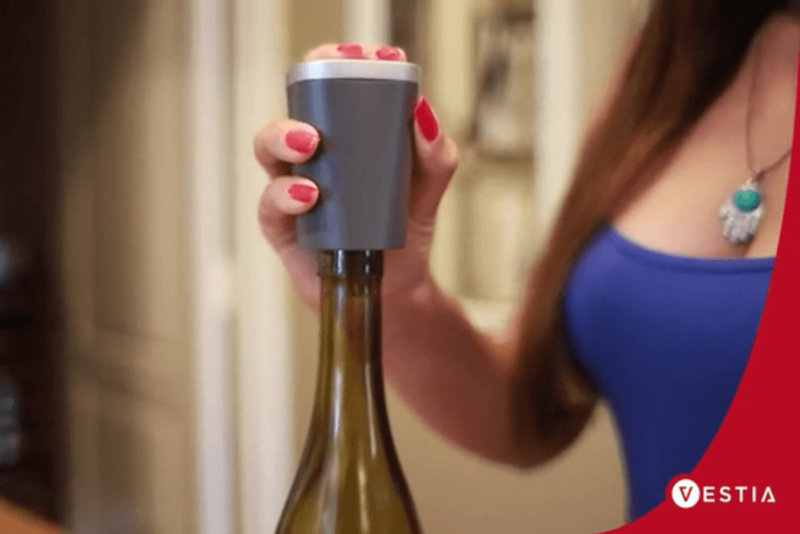 To help get the product off the ground, Vestia launched its wine saver via the popular crowdfunding site Kickstarter this week, looking to raise $35,000 in funding to bring it to the masses. To activate the vacuum, users simply stick the device into an opened bottle of wine and it immediately starts going to work. Once installed, it creates a low-pressure environment in the bottle of wine while also preventing any air from getting in. The attached vacuum — dubbed the Vestia-Vac — completely vacuum seals the bottle, preserving every note of its flavor. Similar to outfitting an opened bottle of wine with the Vestia, removing the contraption is incredibly easy. To do this, owners simply remove the Wine Saver via its release button, then press the button on top of the actual stopper to release the vacuum seal, and that’s it. Now, a bottle of wine opened days, or even weeks, earlier should remain as rich and complex as it was the day that it was opened. Aside from its innovative technology, the Vestia Wine Saver’s price is yet another facet of the device that’s incredibly impressive. Early-bird Kickstarter adopters have a chance of securing one of these products for a mere $17, while regular backers can purchase one for just $20. Fancy multiple wine stoppers? Vestia allows buyers to purchase up to 10 — a package that also comes with a foil cutter, wine opener, and wine towel — for just $240. As of this writing, Vestia has raised roughly $6,500, with 15 days left in the campaign.